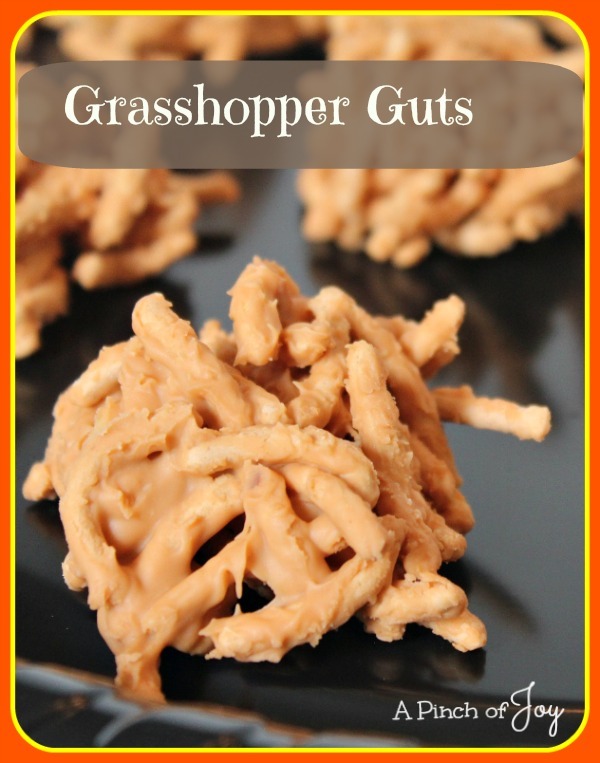 Grasshopper Guts are a Halloween twist on a classic kids treat! This one is simple, not too sweet, and easy to make for your Halloween party. If your preschool regularly allows homemade treats, it also qualifies for the G snack. 🙂 The F snack? Smashed Frog, of course. For a peanut free treat, use chopped almonds or pecans instead. Or go nut free and use mini M&Ms. Chopped toffee is another possible substitute. Halloween in a preschool classroom is fun! The little ones get so excited about dressing up and “be-tending”. Isn’t that a perfect word!? A great term for trying on a new persona. Being and pretending at the same time. That’s the best part of Halloween — letting out the inner princess in charge of the world or being the great superhero monster. Because – ya know – you aren’t really in charge of much in real life and truthfully sometimes you are really scared inside. Some preschoolers really get into the whole thing, mask, trick or treating and all. Others are more timid and barely tolerate cat whiskers gently traced on their cheeks. One young man came in his everyday jeans, carrying his mom’s saucepan. He was Johnny Appleseed – no mask required. The saucepan was his “costume” when he wanted to be a part of the festivities and his leave me alone shield when he put it down. I don’t think the saucepan ever actually made it onto his head, ala Johnny Appleseed, because that would have been too much attention to handle. He did it his way and that was great! Some groups of kids enjoy eating Grasshopper Guts. Others will prefer calling it Grasshopper Food. That’s a little ambiguous, I know. It can be dried grass or grasshopper parts, like legs. Wherever the imagination takes you. Click here for printable Grasshopper Guts tags. Click here for cute printable Grasshopper Food tags. Measure chow mein noodles and peanuts into large mixing bowl. Lay waxed paper or parchment paper on flat surface in preparation for spooning out hot candy. Melt butterscotch chips in microwave at 50% power in thirty second bursts, until melted. (Shape will not change until stirred, so stir after every thirty second burst until mixture is thick liquid). Pour melted butterscotch chips over noodles and peanuts. Stir quickly until noodles are well coated. Drop by teaspoon full onto paper and cool. What a great little treat for the season! Hope you have a great week and thank you so much for sharing with Full Plate Thursday.